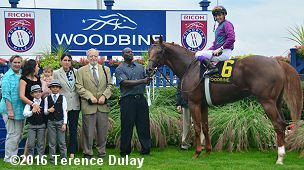 There are three other graded stakes races on Woodbine Mile day, conducted under rainy conditions with temperatures in the low 70's, downgrading the turf to "good". The longest race on the card was the $300,000 HPIBet Northern Dancer Turf Stakes (G1) for older horses going 1 1/2 miles, one complete lap of the E.P. Taylor Turf Course as the major local prep for the Pattison Canadian International (G1) on October 19. 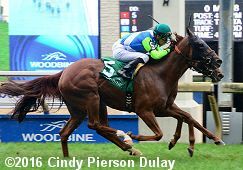 A field of 8 went to post with World Approval sent off as the lukewarm 11-4 favorite, 7th in the Arlington Million (G1) after winning the United Nations (G1) and finishing 3rd in the Manhattan (G1). 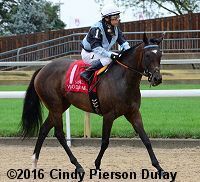 In to challenge him included 3-1 second choice Big Blue Kitten, 6th in the Manhattan (G1) last out, and 5-1 third choice Wake Forest, 10th in the Arlington Million after winning the Man O'War (G1). Down the stretch with The Pizza Man taking the lead between horses. 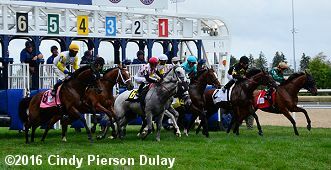 Jockey Julien Leparoux sent favorite World Approval to a clear lead first time by and he set easy fractions of 26.97, 53.99, 1:19.92, 1:44.78, and 2:08.77 while pressed by 11-2 fourth choice The Pizza Man and stalked by 38-1 longest shot Button Down. Entering the stretch, World Approval continued to lead but The Pizza Man came through and held off late-running Wake Forest to win by a neck in 2:31.75. It was a neck back to World Approval third. Left: The Pizza Man in the winner's circle. 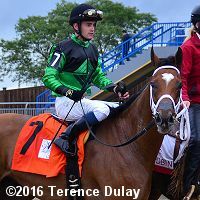 Winning jockey Flavien Prat said, "There was no pace. He was just comfortable near the lead, so that was fine for me. I was really happy the whole trip. When the leader picked it up turning for home, I thought I couldn’t catch him, but when Wake Forest came up on my outside, that helped me to pass him." Right: The Pizza Man poses as his groom gets sprayed in the face with water after the race. Left: The Pizza Man in the post parade. 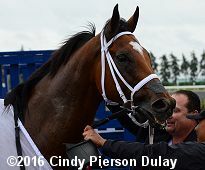 Winning owner Richard Papiese said, "His blood came back bad and then we kind of maybe rushed him over to Gulfstream over a track that he doesn't really like (5th in Gulfstream Park Turf Handicap). And then his blood wasn't really right again. He had a bad trip in the Stars and Stripes and didn't really pick up the bit (finishing fourth). It's all good though. We'll look at the Canadian International first, and maybe come back for the Breeders' Cup if it doesn't come up too quick. It will be up to Roger. But we want to do what is best for him." Right: The Pizza Man ready to go back to the barn after the race. Left: Second place finisher Wake Forest returns after the race. Jockey Irad Ortiz Jr. said, "I had a good trip. The slow pace killed me, maybe. He ran a really good race. He was coming at the end but he got beat by a good horse." Right: Third place finisher and beaten favorite World Approval behind the starting gate. 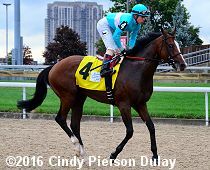 Jockey Julien Leparoux said, "He ran big. He tried hard." The horses break from the gate for the Northern Dancer Turf. 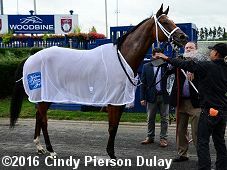 Winning owner Richard Papiese said, "We were worried a little bit at the beginning of the race if he was too close and not saving ground, but it was a very heady ride because of the pace. Flavian rode him great. That was him. The game plan was to save ground and let him run in the stretch, but you go to 'Plan B' when 'Plan A' is pretty much out the window, and he didn't wait. He knew they were going really slow and we knew it'd be very little pace anyway and we were hoping to be in the middle of the pack and maybe get first run. But this was much better." 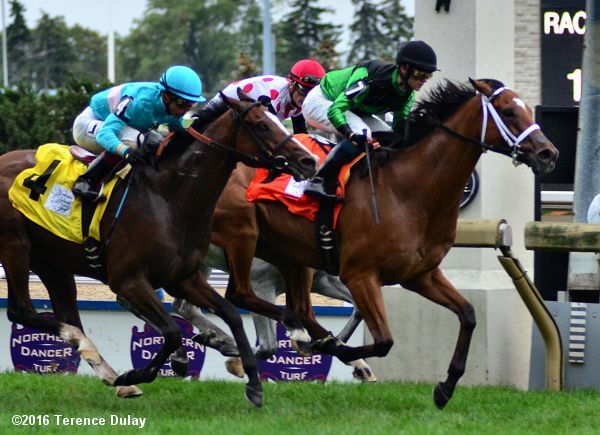 The $300,000 Canadian Stakes (G2) featured a field of 10 older fillies and mares going about 1 1/8 miles around 1 turn of the turf, and is a "Win and You're In" event for the Breeders' Cup Filly and Mare Turf. 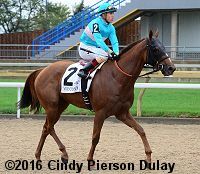 New York (G2) and Diana (G1) winner Dacita was sent off as the even-money favorite over 9-2 second choice Rainha Da Bateria, 3rd in the Diana (G1), and 5-1 third choice Faufiler, 5th in the Beverly D (G1). 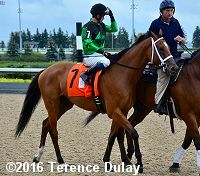 Jockey Flavien Prat sent 11-1 Midnight Miley loose on the lead through fractions of 23.85, 46.42, and 1:11.29 while as many as 6 lengths clear of Rainha Da Bateria and Faufiler stalking her second and third respectively. Entering the stretch, Midnight Miley tired badly as Rainha Da Bateria inherited a 2 length lead through 1 mile in 1:35.96. dacita, 6th early, split horses in the lane and rallied well late but Rainha Da Bateria held on to win by a nose in 1:46.87. It was a long 3 1/4 lengths back to 6-1 Strut the Course third. 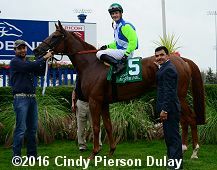 Left: Rainha Da Bateria in the winner's circle. 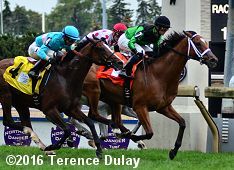 Winning jockey Julien Leparoux said, "She didn't mind the softer ground. She wants to be where she puts you. She was very comfortable, she broke sharp and then she settled and was relaxed. She did good until she came down the stretch and started looking around a little bit and getting out. That was a new thing I learned about her but at least she won." Right: Rainha Da Bateria in the post parade. Left: Second place finisher and beaten favorite Dacita returns after the race. Jockey Irad Ortiz Jr. said, "I had a good trip; we just got beat. She had a good kick; she ran good. She liked the turf. But, we got beat by a good filly." Right: Third place finisher Faufiler returns after the race. 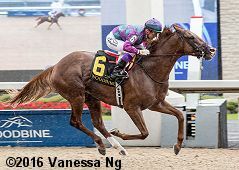 The Graham Motion trainee improved her record to 6 wins, 3 seconds, and 3 thirds in 17 starts, earning $404,054 for owner-breeder Flaxman Holdings. 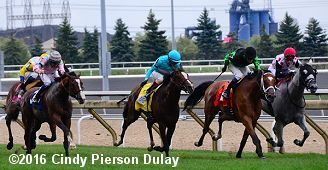 Kicking off the stakes action for the day, the $150,000 Ontario Derby (G3) featured a field of 6 three-year-olds going 1 1/8 miles over the Tapeta main track. Plate Trial and Prince of Wales Stakes winner Amis Gizmo was sent off as the 2-5 choice over 9-2 Zero Hour, a maiden winner last out, and 13-2 Dragon Bay, third in the Better Talk Now at Saratoga. Jockey Luis Contreras sent Amis Gizmo to a clear lead first time by and he set fractions of 23.80, 47.87, and 1:11.59 while as many as 2 lengths elad of 21-1 English Illusion and Dragon Bay stalking him second and third. Entering the lane, Amis Gizmo left the field in his wake, clocking a mile in 1:35.48 and drawing off to a 6 length win over Dragon Bay in a new track record time of 1:48.30, shaving 3/100 second off the old record. It was another 2 1/2 lengths back to English Illusion third. The race was marred by tragedy as Bruce D Memorial winner Yo Carm broke down on the far turn with a fractured left front ankle and had to be euthanized on the track. Jockey Irad Ortiz Jr. was unhurt and rode the rest of the card. 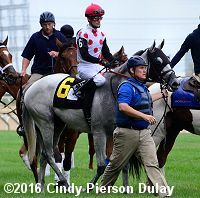 Left: Amis Gizmo in the winner's circle. 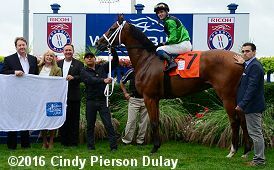 Winning trainer Josie Carroll said, "I think he handled the turf quite well (when 6th in the Breeders' Stakes). 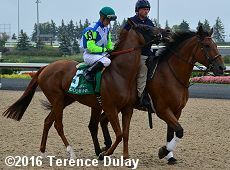 I think he handled the 1 1/4 miles (Queen's Plate). He just isn't a mile and a half horse; So few horses these days really are mile and a half horses. We’re quite happy with what he does. 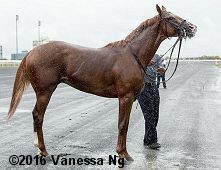 When Luis went to the front, I really wasn't that concerned because he knows this horse. I was more than confident he (Luis) knew what he was doing." Right: Amis Gizmo gets hosed off in the rain. Woodbine Mile (G1) results - the feature race of the day won by Tepin.